A traditional mirepoix involves carrots, celery and onion; due to geographic and cultural divides, as well as taste preferences, variations have of course come about over time and often only include one of the original ingredients… which means that I don’t feel terrible at all about nixing the onion and replacing it with leek and chives! A mirepoix actually forms the base of many sauces, stews and stocks – I’d been making one for ages unintentionally – and you have been, too – before I even knew it had a name. You know the browned vegetables that constitute the beginning of a stock, a pasta sauce, a chili or even the butter chicken sauce recipe on this blog? They are all actually a “mirepoix.” Go figure. I had no clue until a year ago, I just thought it was what you were supposed to do. Which you are. But it has a name. I’ll stop now. I have adjusted this recipe of Alton Brown’s to be low FODMAP. You can use mirepoix as a pasta sauce on its own, to bake with oysters or top a pizza. Anything goes, really. I love versatility. 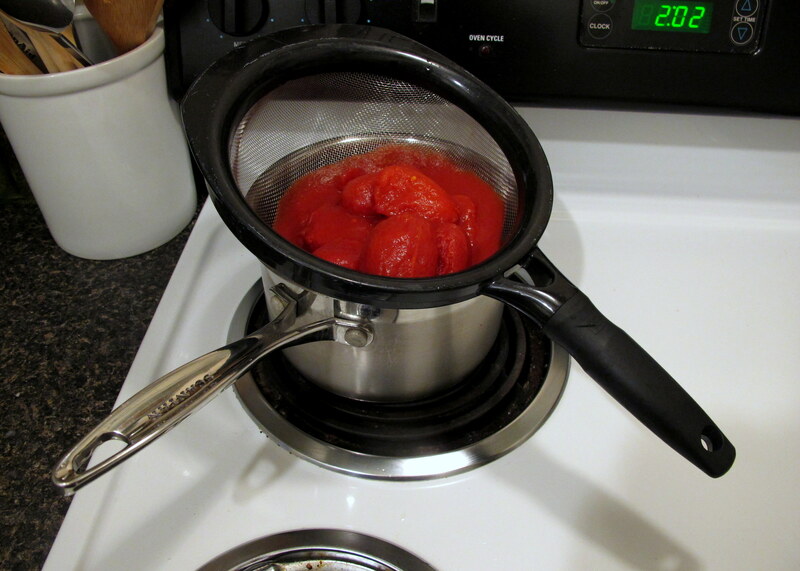 Thanks to the dry heat used, which intensifies flavours, this simple method adds a real depth of flavour to dishes that require a tomato sauce base. Celery contains enough mannitol to be high FODMAP if you eat an entire stalk, which you wouldn’t be doing here. However, if you are very sensitive, just reduce it or sub in some extra leek or add in celeriac (for texture). Green leek tips are low FODMAP in half cup servings, so unless you eat the entire batch of mirepoix, you should be fine. Tomatoes are low FODMAP in half cup servings. Carrots are low FODMAP in about a quarter cup serving size. Garlic infused oil is tolerated by many who are sensitive to fructans, even though it seems counter-intuitive. 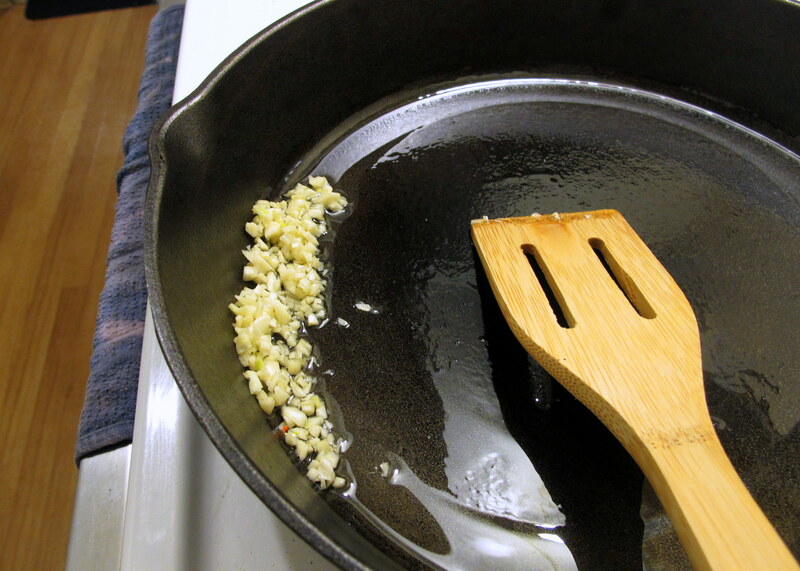 FODMAPs are water soluble, so the garlic sizzling/infusing in oil shouldn’t leach out too many fructans. Simple solution – use a pinch of asafoetida in its place, which is both low FODMAP and gluten free (unless wheat flour is used to cut it). Red wine is low FODMAP in 150 ml servings. Red wine vinegar is double fermented red wine, so it is also safe. Balsamic vinegar is low FODMAP in 1 tbsp. servings, which is all there is in the entire recipe. Serves 12-14 FODMAPers, depending on tolerance. 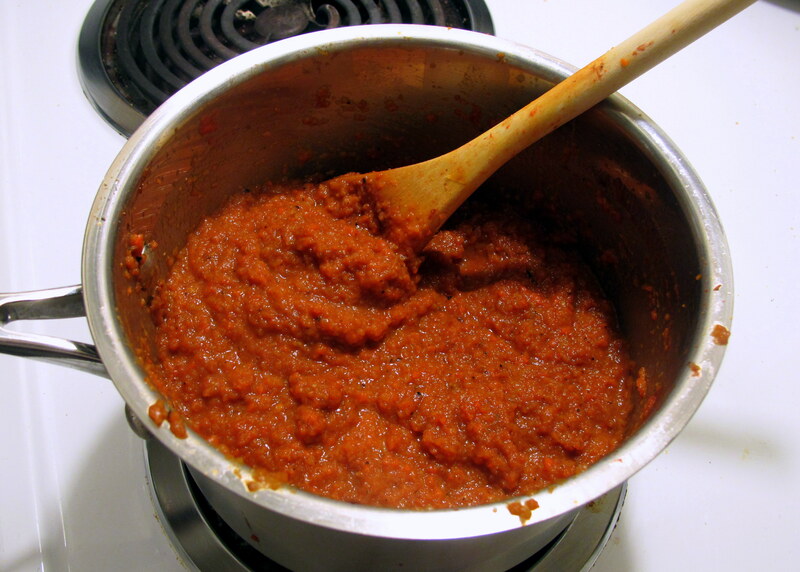 Strain the tinned tomatoes completely – give them a squish to make sure all the juice is out – and reserve the liquid. Prepare all the veggies as required above. Combine the tomato liquid, red wine, chives, vinegars and herbs in a saucepan and bring to the boil, before lowering heat to a simmer and reducing volume by half. This should take about 20 minutes. Meanwhile, preheat grill/broiler of your oven (grill in Australia = broiler in USA) and then simmer the whole garlic cloves over a med-high heat on the stove top, in an oven-safe pan, until fragrant and then discard if you are sensitive (or dice and leave them in if not). I love my cast iron pan; like this sauce, it’s versatile – the most versatile piece of cookware that we own (bake cakes/breads, stove top, grill/broiler safe, arm workout, you name it). Add in the leek tips, carrot and celery and sweat the veggies until tender. Add in the tomatoes, then put the pan under the grill/broiler (on the top/second shelf) and leave it with the oven door open for 15 to 20 minutes, until the tops have begun to char. This adds flavour and is a good thing, so let it get moderately charred. Once the veggies have sufficiently blackened, put them back on the stove, on a medium heat and add in the capers. 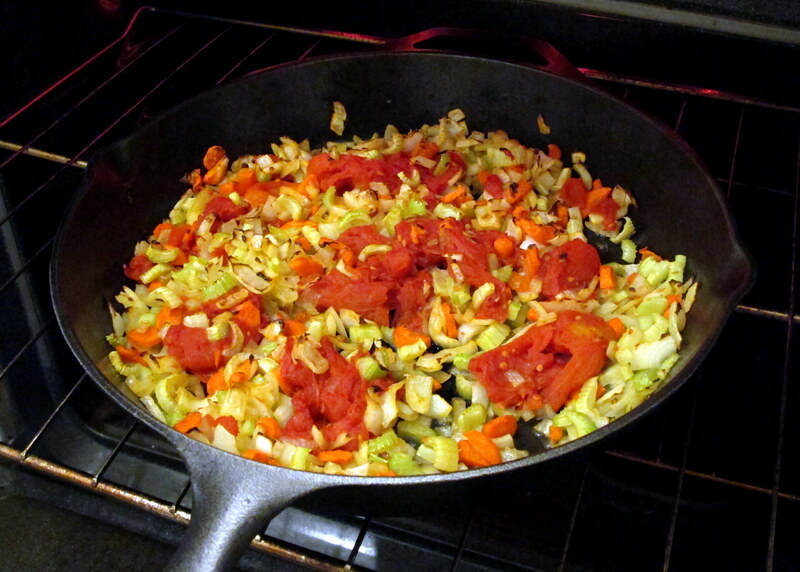 Saute for a minute and then tip the veggies into the (now reduced) tomato liquid. 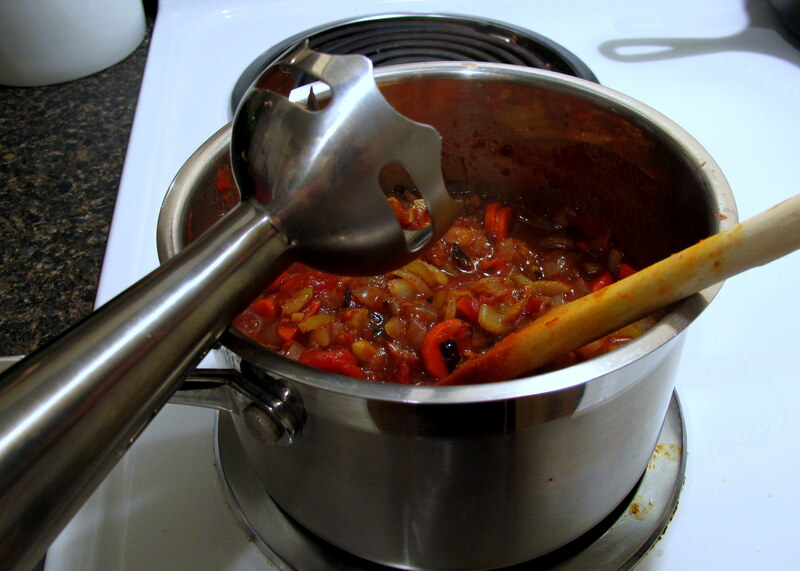 Use an immersion blender to puree the mixture to the texture you need (i.e. pasta sauce would be chunkier than a pizza sauce), then flavour with salt and pepper before simmering for a further 5 minutes. You’re done! 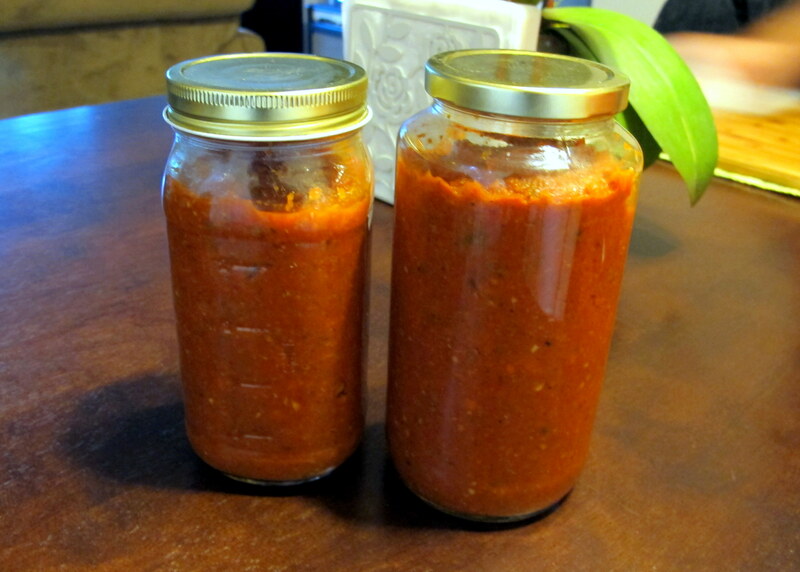 Unless of course you want to preserve/can it, which I recommend, as you can make big batches and have jars on the ready for when you’re feeling lazy. 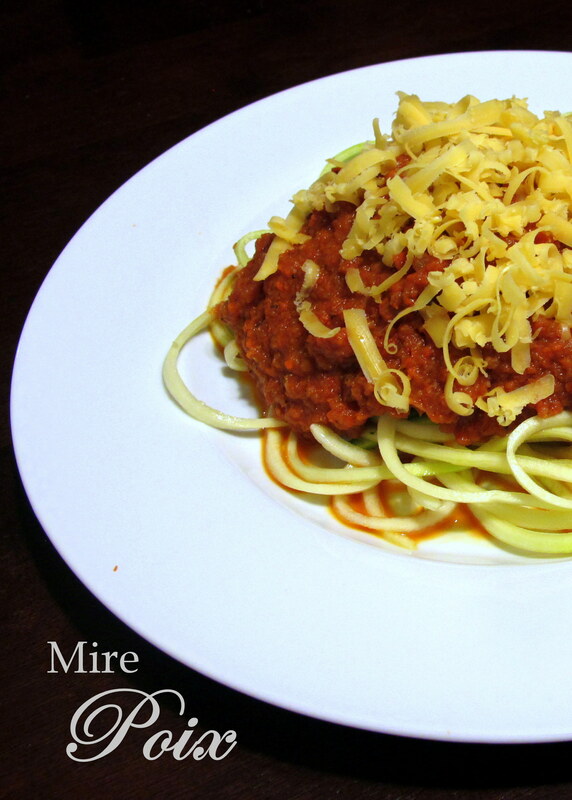 This entry was posted in Dinner / Mains, Italian, Sauces & Dips, Tips and Tricks, Vegetarian or Vegan Entrees or Sides, Vegetarian or Vegan Mains and tagged appetiser, base sauce, cooking basics, dinner, entree, FODMAP, FODMAPS, french, fructose friendly, fructose malabsorption, gluten free, healthy, home-cooked, homemade, Italian, low fat, low sugar, mirepoix, onion free, preserves, sauce base, tomato, vegan, vegetarian. Bookmark the permalink.